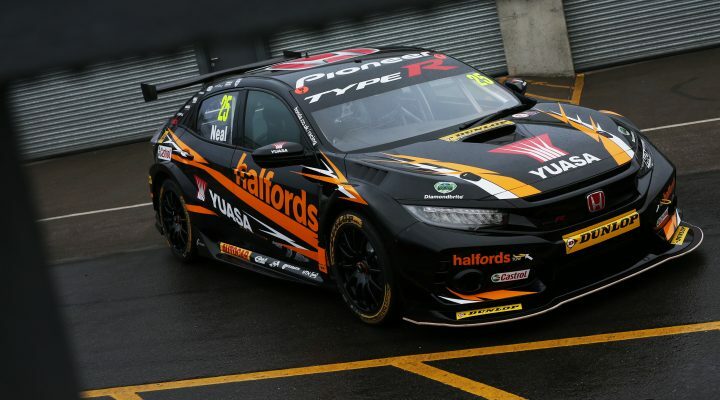 Halfords Yuasa Racing’s new-shape Honda Civic Type R showed off its true colours for the first time at Donington Park today (27 March), as its distinctive livery stole the show at the traditional Dunlop MSA British Touring Car Championship (BTCC) Season Launch. In a fiercely competitive series in which nobody stands still, Halfords Yuasa Racing’s 2018 challenger has been one of the most eagerly-anticipated new arrivals in years. Already spied testing at Parcmotor Castellolí in Spain and back on home soil at Rockingham and Brands Hatch, the Civic Type R (FK8) had only been spotted in stealth mode – until today. Sporting the same striking black-and-orange combo as it has since 2016, Honda’s title hope will be piloted by three-time champion Matt Neal – the most experienced driver on the current BTCC grid – and series newcomer Dan Cammish, who comes with a glittering résumé having won back-to-back Porsche Carrera Cup GB titles on the TOCA support package in 2015 and 2016. Both Neal and Cammish will take to the track alongside their 30 rivals at Donington Park this afternoon, as the first shots are fired in the quest to clinch the most coveted crown in British motorsport.